The Best Art Tour in the Northwest! The Holiday 2013 Vashon Island Art Studio Tour will be held on two weekends, December 7th– 8th and 14-15th, from 10AM – 4PM each day. It’s a free, self-guided event. Preview the art and follow the numbers designated on the Studio Tour map, which is available online at VashonIslandArtStudioTour.com, and at most island businesses. Forty-five studios, shops and galleries (representing over 150 artists!) will open their doors to visitors. 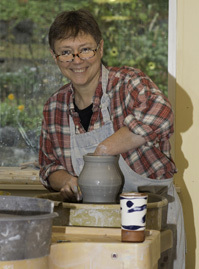 “I’m a producer of earthenware pottery and I’ve been doing it for 35 years. I have a great relationship with color. That’s why I enjoy working on a white background, and earthenware gives the brightest colors. Over the years my work has become more and more decorative, and the colors are more popular now. I like making pots for people to use. I work with kids and adults in my teaching studio. I conduct classes and summer clay camps here so it’s an active place and a nice little community of clay people. View Whole Month, click here. Copyright © Vashon Guide - Shop, Play, Stay on Vashon Island. Lodging and Travel Information.